What will your timber be worth tomorrow? Logs are a commodity traded in competitive markets, know real prices before you start negotiations. Timber is bought and sold in competitively priced, open markets, where equilibrium prices are settled between buyers and sellers. Sellers who are not frequently engaged in these transactions face a challenge to anticipate equilibrium prices. The Real Price Appreciation Forecast Tool is aligned within individual timber markets to create a Reserve Price Indicator for individual timber sorts and grades. When combined with forest Growth & Yield predictions, results guide forestland owners to achieve financially optimal financial returns. Timber harvests create logs to be sold to lumber mills. Logs are a commodity, normally traded in competitive markets. Prices are responsive to supply and demand forces. Feeling that prices will move upward or downward in the near-term is a commonplace timber market perception. Several trade journals even make these projections monthly. Look closer… did the article give a price per thousand board feet or by ton? Generally, NO. We can do better than that. Consider the Real Price Appreciation Forecast Tool for your analytic efforts. Generally, timber market analysts make assumptions that tomorrow’s prices will be about what they were today. When they reach out a little to the mid-term, they prognosticate that timber market prices will be “probably higher”, and sometimes “probably lower”. Rarely do forecasters quote future prices for timber sales scheduled weeks, months, or years in advance. Forestlands represent an asset made of growing forests. Here, water is filtered and perked through soils. Clear air is released to the environment, and cultural traditions and norms enjoyed by everyone in the region. Whether the forestland owner is selling carbon sequestration rights to the carbon stored in tree boles, or cutting trees to be sold for lumber manufacture, there will be an exchange of considerations. Furthermore, some forestland owners try assuming ultimate profitability to a venture that may take a century to realize. Due to this, they really cannot rest with the assumption that prices will be “probably higher” than they were today. In FRASS, utilizing the Real Price Appreciation Forecast Tool, forestland owners can achieve a higher level of financial preparedness. Even forestland owners who do not plan to soon harvest timber on their property, but will sell or purchase forestlands must be able to accurately appraise forestland asset value. Before you approach a real estate agent to purchase a new home, you generally check the housing market. Buyers want to see what price levels have recently been established. You may have anticipation of future price increases of a home you may purchase. Seems like you speculate on future value increases. At least with a home, you will benefit from living in that purchased asset. Timber is a commodity traded in competitive markets. Buyers make the logs into commercial goods like lumber, pulp, paper, and fiber. Those products all interact in ‘downstream commodity markets‘ where other forces of supply and demand settle exchange prices. As a result, we call timber a ‘derived demand‘ commodity. Consumers do not purchase 32’ Douglas-fir logs to build their new home. Consumers hire a building contractor who will pay employees, purchase the lumber and other commodities to make the new structure. As a forestland investor, your operation gives attention to the economic realities. Realities happen in terms of forest site productivity, species selection, silvicultural costs, and timber price cycles. These activities necessitate an obvious need for accurate price forecasts of timber. These conditions led to the creation of the Real Price Appreciation Forecast Tool. It guides predictions in timber price forecasting. This situation calls attention to the need to match timber commodity price predictions with well-developed biometric estimates. Forestland value changes through time as trees mature and as price cycles appreciate or devalue in relation to inflation. Therefore, these forces affect forestland appraisals, financially optimal timber harvest timing, and asset return on investment considerations. 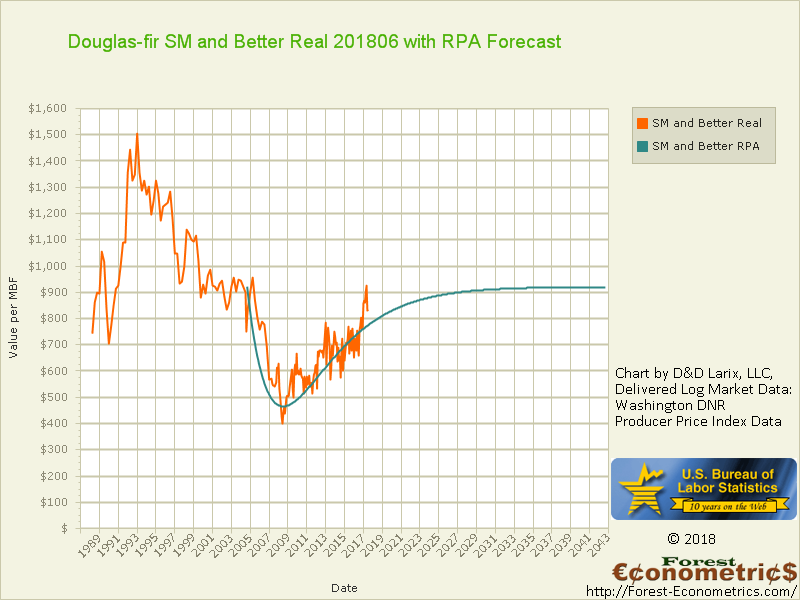 The Real Price Appreciation (RPA) Forecast Tool was initiated in 2009 in the aftermath of the Great Recession. Monthly market data collected from independent commodity exchange markets is synchronize with federal economic statistics. The economic data synchronization is made to convert the nominal price data generally reported in popular media sources. The conversion creates real values expressed in terms of today’s currency value. Once, real values were stated in terms of an out of date point, like 1990. Now, we restate real prices in terms of today’s currency, always updated as current information is released. This makes it possible to consider all values in context of how we place value today. This is the world we live and trade in: we make the most of it. First, this is fundamental to making price reporting meaningful and to realize how real prices have cycled through time. Although analysts have long-stated that forestlands serve as a hedge against inflation “because timber grows faster than inflation devalues our currency”, we can recognize that is not always true. Ultimately, timber commodities in each marketplace respond to domestic and international demand forces. 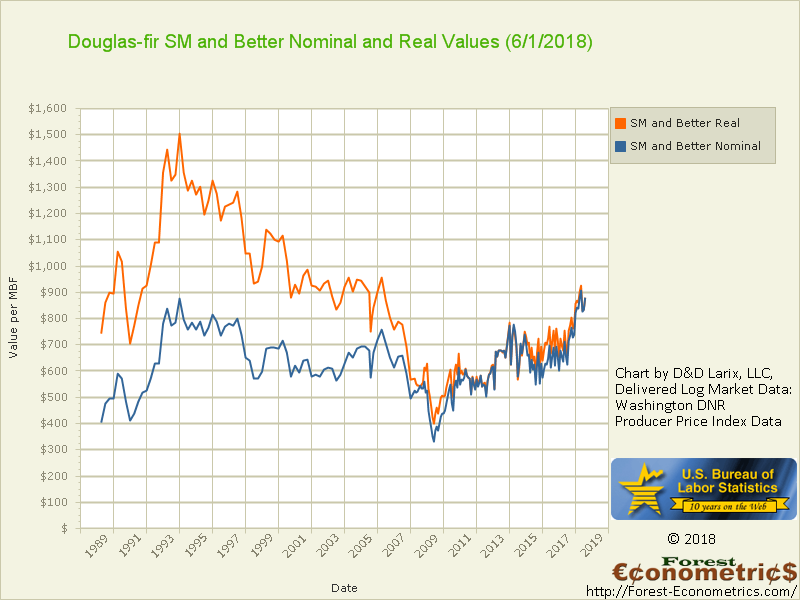 In the 2010-2020 cycle in the Puget Sound, Washington, timber market, we can recognize how real prices are on an increasing price trend from month to month. However, we also recognize how price shocks and random noise spike real prices up and down in short-duration events. We know these shocks happen, but also know these are not cycle establishing events. Use the Real Price Appreciation Forecast Tool to illuminate market cycles as they happen. This was the impetus leading to the development of the Real Price Appreciation Forecast Tool: make price-cycle predictions through time to synchronize with forestland growth realities. The RPA Forecast Tool requires access to clear and reliable nominal prices collected consistently through time. The more data available to the analyst, the better. Monthly data, or even weekly data, is more preferable than quarterly data, and all are much more preferable than annual data. Annual data are often collected by federal agencies. For instance, the US Forest Service (USFS) reports released in the first quarter of each year to give a review of markets in the past year. It is very common to find USFS reports summarizing stumpage market prices as opposed to delivered log market prices. Examples given here are all for delivered log market data because those prices represent the money paid specifically for the logs fitting into specific sorts and grades. Those data value the logs delivered to the final buyer of the timber logs sold. Conversely, in stumpage markets, prices are summarized by species, giving a sort price. However, the costs of logging, trucking, road building, and often even reforestation expenses are subtracted from the stumpage value. Generally, the lumber mill is not the stumpage timber sale buyer: it is the logging operator who signs the contract. Log grades are not specified in the stumpage market transaction. All grades are co-mingled as payment is made to the forestland owner. Regardless of the timber sale structure, the Real Price Appreciation Forecast Tool is used to forecast price patterns. It applies to both structures, but reveals valuable insights as it is applied to delivered log markets. Western Washington’s Puget Sound log market, and western Oregon’s five Regional markets, maintain a competitive delivered log market infrastructure. Some of the nearest neighbors to these areas do not. In Eastern Washington, Idaho, and Montana, logs are transacted in a camprun structure. There, tree logs are competitively purchased for a camprun price. Further to the north, in British Columbia, Canada, and in Alaska, USA, stumpage markets also hold market dominance. When international log commerce is considered, attention moves back to the delivered log market structure. Japanese buyers have negotiated log sales from the west coast of North America since about 1960. Log characteristics define the prices paid by foreign buyers. Today, Asian companies negotiate for some of the highest quality logs transacted, and they pay significantly. Logs exported to China or Japan are not identical to domestic log grades purchased in the USA. Asian export logs are cut to metric lengths, generally in 12 meter lengths, plus trim. In USA west coast markets, Scribner scale commonly takes logs cut to 32 feet (9.7 meters), plus trim. The prices for the export grades are generally higher than the “matching” domestic small end diameter logs. Sellers must consider the extra length of each log and the finite length of the merchantable tree’s bole. Log sellers can recognize potential trade-offs in total revenue from each tree. Sometimes, it does not ‘make more bank’ to high-grade the export logs from the domestic grades. Forestlands with desirable tree characteristics of competitively priced species can sometimes increase profitability by merchandising logs into select export grades. But success is not always guaranteed. Harvest analysis should always be considered in detail. Consider a 12m (39′) log, plus trim, cut from the bole of a tree. Consider the next log up the tree bole, will that log scale as a 3-Sawmill grade, or as a 4-Sawmill grade? The combined log grade values from each tree determines the highest returns possible. On this site and in videos, we give example of the Real Price Appreciation Forecast Tool. These apply to the prices paid for specific log sorts and grades. Much of the data we use is acquired on a monthly basis. We match the timber volume projections made through the forest biometric resources we engage. Trees have one growing period each year, but they are sold on a daily basis. Monthly price projections are combined with the annually changing tree growth data to make actionable price forecasts. The Real Cost Appreciation Forecast Tool is a variant of its predecessor. Prices and costs in forest management transactions respond to similar, but not identical market forces. Similar credentials are applied to significant timber harvest and delivery costs. Forest Management and Administration (overhead). Each of these cost parameters respond to business cycles in the macroeconomy. These cost cycles are generally not on identical trends with delivered log markets. Recall the derived demand for timber comes from demand for lumber used for housing. Trucking responds to competitive industries for moving goods between markets, and to the cost for fuel. Some costs are reflective of demands for the same commodity from other industries. Some are responsive to derived demand from other market segments. In each case, those trends can often change the timber harvest profitability profile quickly. For example, recognize that reforestation was included on the cost forecasting list. We treat reforestation as the last step of the harvest event for the current timber rotation. Every state forest practices act, tribal forest management platform, and agency forest administration depart addresses reforestation. They all require timber harvest events conclude with successful reforestation. Planting trees is obligatory as a part of timber harvesting. In light of this, we discover seedling cost trends through time. Some Assembly Required – this is what we do. Real Price Appreciation Forecast Tool and Real Cost Appreciation Forecast Tool predictions are made with our clients. Markets where our client’s forestlands are located guide these analyses. Furthermore, records are assembled with forestland data specific to each property’s area. Forested tracts may be considered as an 80 acre parcel. However, the parcel may actually be a collection of 5 or 10 discrete timber stands. Analysis begins at the timber stand level. Furthermore, each timber stand may have been established at different times and have a different species composition. Some timber stands may be completely, or partially, in riparian zones, be part of a threatened, endangered, or sensitive species habitat, or be completely inaccessible to traditional logging access. Therefore, we treat each timber stand as a unique part of the entire asset. The price and cost prediction horizons enabled through FRASS are one significant gear in this optimization approach.